Discussion in 'Creative General Discussion' started by MasterDeath, Aug 20, 2011. Hi guys, does the topic still exist on here? I tried googling but everyone linking to it leads to an error page. Halp? 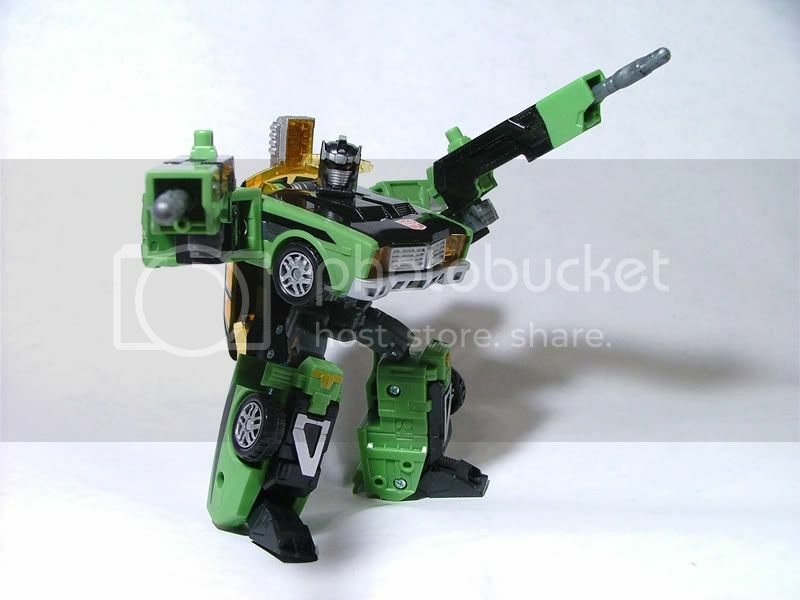 Seriously tho, I had the forethought a long while ago to save the tutorial in my mods folder for when I did this to my Cyb Downshift...it works great too! . I'll re-post it tomorrow for ya in Redline's gracious name. I hope I get the order of the pictures right but you should be able to get the gist of it nonetheless as its a pretty easy & straightforward mod. Keep a watch on this thread for it amigo! 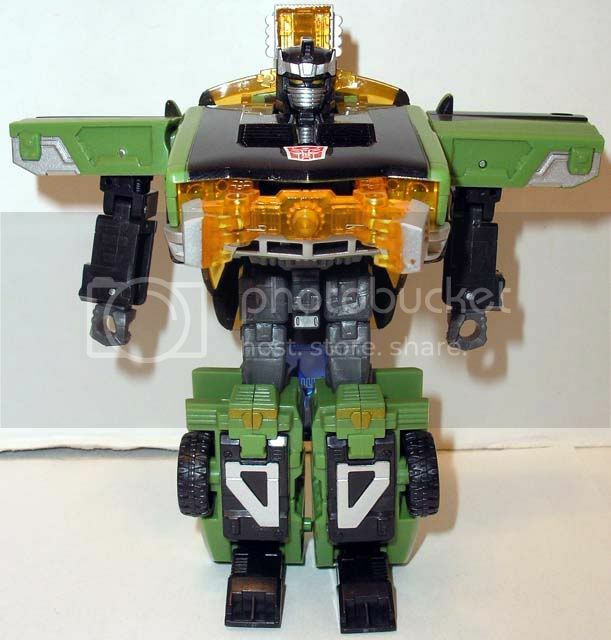 Hey guys, For reasons unknown, today after I got home from work, I got the sudden urge to attempt to fix Cybertron Downshift's head. This is a big deal, cause I NEVER mess with my toys! 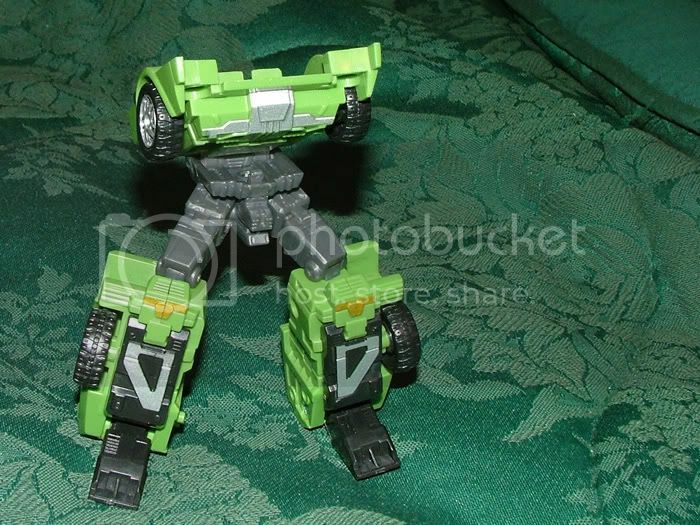 If you didn't know, you can wiggle Downshift's head ever so slightly, just enough to know that it can and will rotate, but the head doesn't raise up enough out of the hood in order to clear the body and be able to fully rotate. Guess what? I was successful!! I have very few tools, so I actually used a cordless drill since I don't own a Dremel (boy do I wish I did!) Anywho, if you have a Dremel, please use it, if not, a Cordless drill with a 3/32 drill bit will work just fine. The only other tool you will need is a tiny screwdriver I've come up with this nifty guide, including pictures, so that any of you who are brave enough can also surgically remove the Viagra pill from your Downshift's neck! 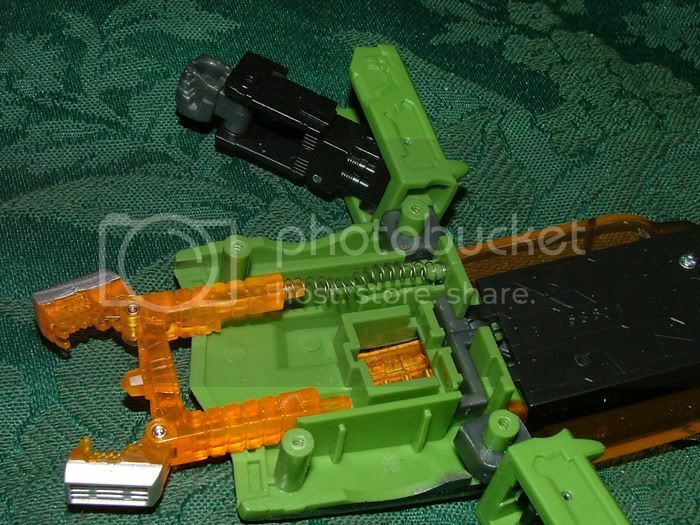 4- Carefully remove the Claw, its small spring, and slide the head down (as if it was going IN the body) to remove it. 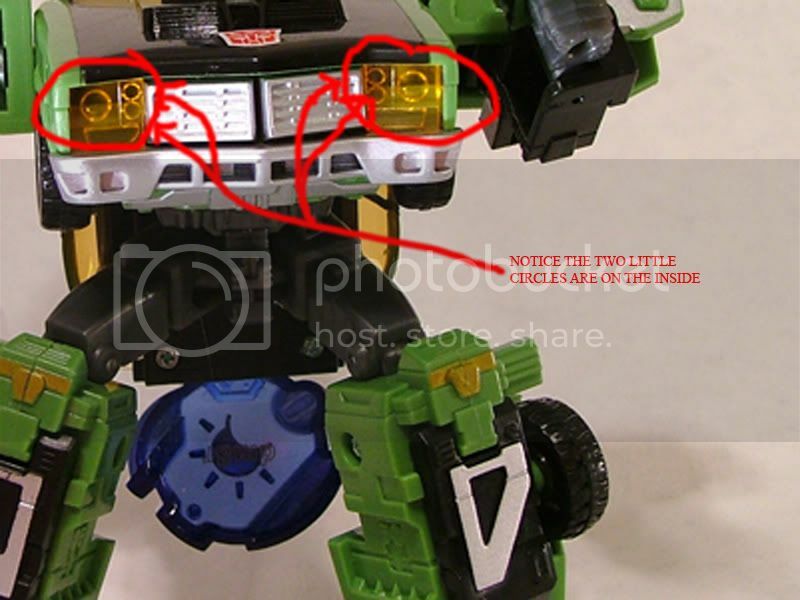 Ok, Here's a picture of the head, look at the red circles. see the tabs? You can only see two of them in the picture, but you should also note that there are FOUR circled! 5- OK. 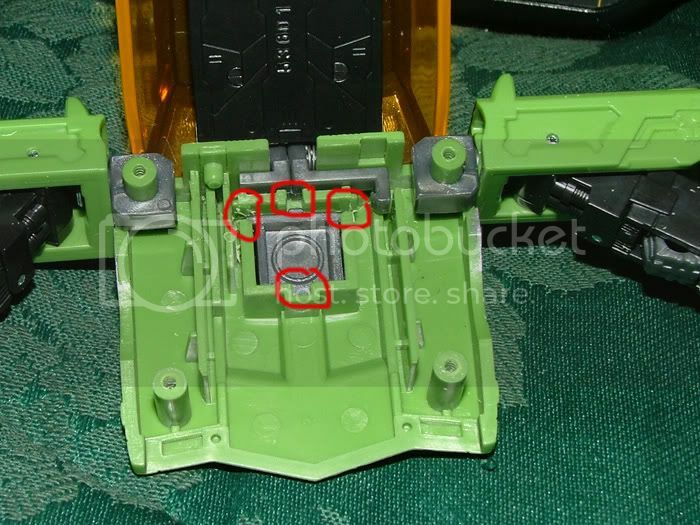 The next picture shows you the SLOTS that those four TABS slide up and down when the automatic head operates during transformation. These SLOTS are where we are going to be doing our work! 6- Ok, before we start work, I want to point out some things first. 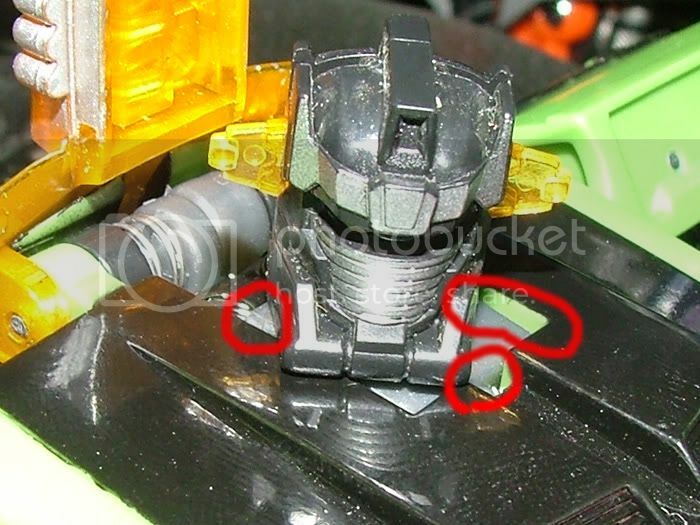 The reason Downshift's head is flawed, is that these SLOTS are too short, not allowing the tabs to be able to move enough to allow the bottom of the head to clear the hood. We're going to increase the length of these SLOTs, but to different lengths, because if you look at the head, you'll notice the front and back TABS are not at the same height as the two on the sides! Alright, here's a picture from the top after I finished to show you where you can see how much clearance you want to finish up with. The circled areas show you how at the different points the clearance is different. 7- Now we're ready to do surgery! Take your Dremel or your Drill, whichever tool you're going to be using, and carefully start working on the front groove, and make it continue all the way through the top. Do the exact same thing for the one that is centered at the back of the head hole. Once you've done this, its time to do the two grooves on the sides. I didn't do exact measurements, just work them up a little bit at a time, inserting the head through the hole until you get it just right. I did however notice a guide to help you speed it up just a little bit... if you look in the hole, there's a seam in the plastic that travels horizontally around. you need to at least get past that, to approximately 1 mm or so short of going all the way through. DO NOT GO ALL THE WAY THROUGH!! 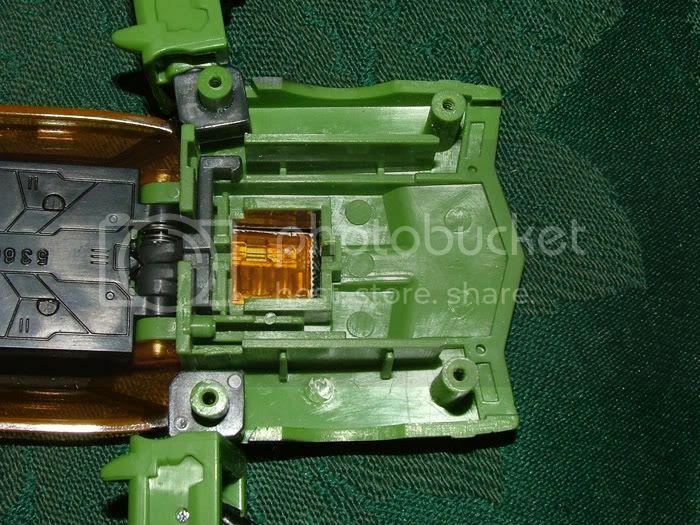 These tabs are necessary, for without them, when you transform him into robot mode, the spring would shoot the head clear of the body because there'd be nothing to hold it in place!! Use the head's tabs (their distance to the bottom of the actual head) as a gauge as to how far you need to go. The whole process only took me about 5-10 minutes. Since I didn't know what I was doing, nor what to expect when I first cracked him open, I went really slow so I ended up after about 20 minutes, but it shouldn't take you that long from beginning to end. Once you've got the 4 SLOTS finished, its time to reassemble. Lay the hood upside down, grab the head by the sides, and use your fingertips to push the ears up with the one hand, line the head up with the hole, and if you need to, use your other hand to actually push it up in there while you're holding the ears closed. Once the head is in the hole, lay the whole thing down. 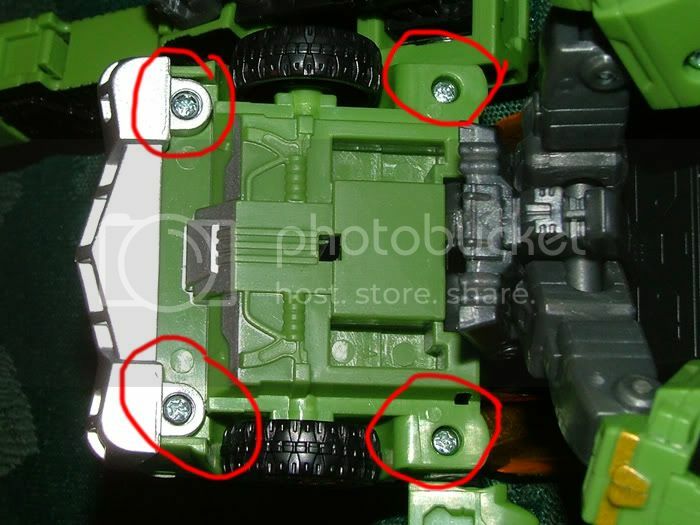 If your head spring came loose, lay it down over the lil circle molded into the headplate. 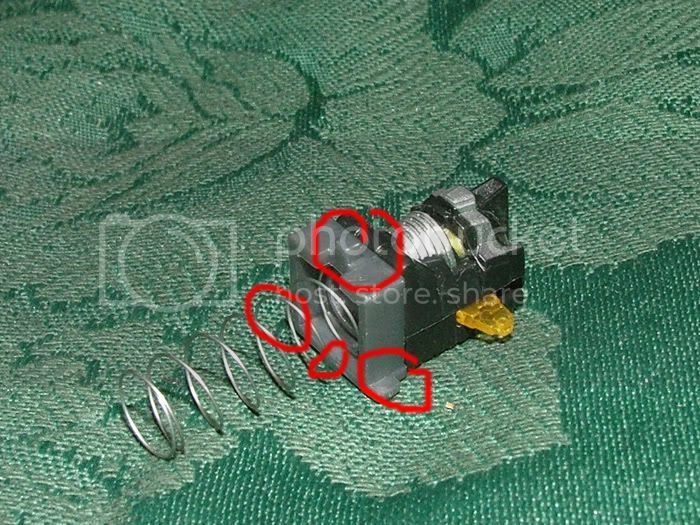 Get the small long spring for the Chip gimmick, and attach one end to the orange round tab at the back right corner (opposite of the hook for holding the claw in when not engaged), then take the hook at an angle and stick the orange tab on it to stick in the other end of the spring. Now you can just gently lay the hook down onto the underside of the hood, where it normally is when its extended. Now, take the lower body and carefully line up the four corner pegs with the holes of the lower body and press the two together. Hope this is the one you were looking for, good luck with Downshift! Hey MD! was just curious to see if you'd had the chance to try the head mod yet & how it worked out for ya?